Nutrinovo are delighted to announce a further extension to their ProSource Jelly range with the launch of a great tasting blackcurrant flavour variant. With 20g protein in every 118ml cup, ProSource Jelly is a unique option for patients requiring oral nutrition and/or those with dysphagia*. ACBS approved, ProSource Jelly is now available in 4 great tasting flavours, contains virtually no carbohydrates, is ready to eat, and offers a refreshing alternative for patients who need additional protein without unnecessary volume. 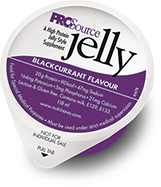 *ProSource Jelly is pre-thickened, making it suitable for patients requiring additional protein with dysphagia. ProSource Jelly measures IDDSI level 4.